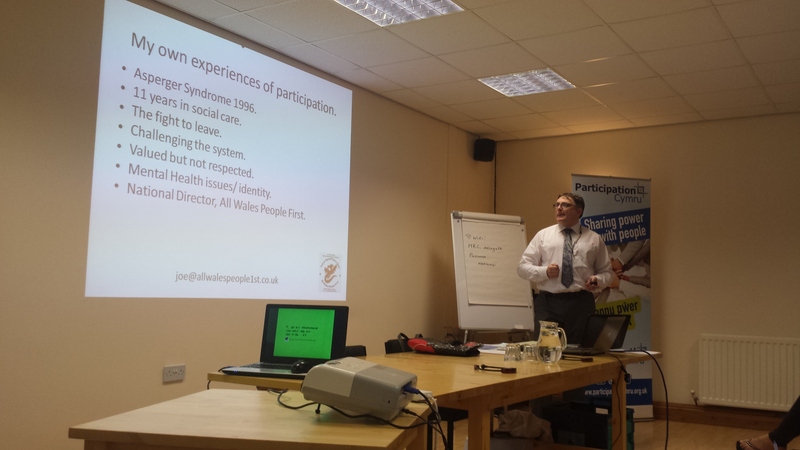 At the All Wales Participation Network this year, Joe Powell set the tone with a powerful opening speech about the importance of full participation in society for people with learning disabilities. Joe was diagnosed with Asperger’s Syndrome in 1996 and has spent 11 years in social care. He is now National Director of All Wales People First; a group uniting the voices of self-advocacy groups in Wales. Joe drew on his first hand experience of fighting to leave a system that was determined to see him purely as a service-user, someone needing assistance, and not as someone who also had a lot to offer to his community. 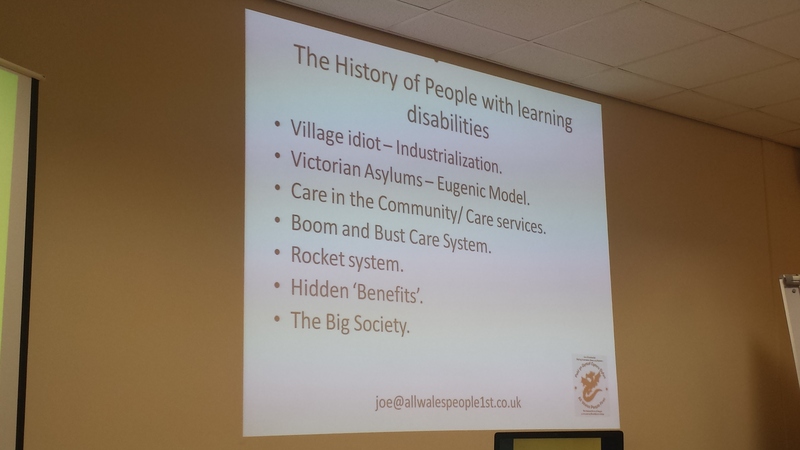 Joe began his talk by outlining ‘The good life model’; values that are important to the people with learning disabilities Joe has spoken to. These values included ‘loving and caring relationships’, the choice that is derived from having some wealth (implicitly this includes control over one’s financial assets), a ‘contributing place in the World’ and ‘a home of my own’. 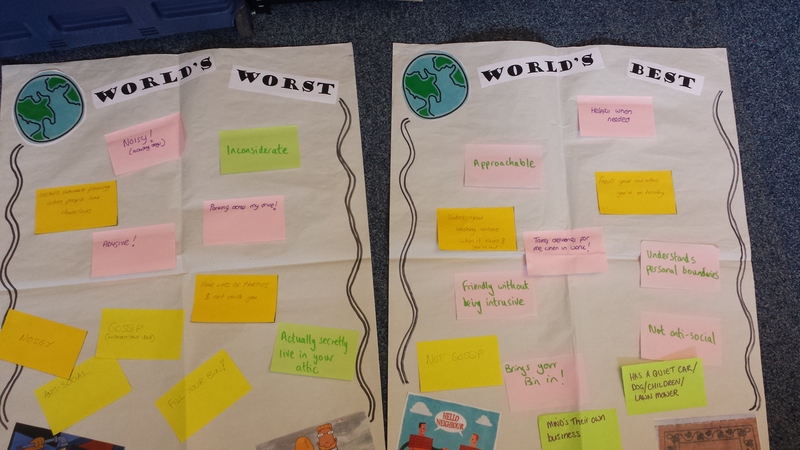 The first thing that struck me was how similar they are to what a non-learning disabled person wants from their own life – these values seemed universal, as opposed to learning-disability specific. All of the values were, to my mind, underpinned by a balance between personal safety and security on one hand and on the other a sense of being able to take agency over one’s own life and further, contribute something to the lives of others. Isn’t this what everyone wants form their lives? Many people with learning disabilities also have a visual impairment and some of these people were not taught to read at school. Simple measures such as offering easy-read information and audio format can make it possible for people with learning disabilities to access information without having to rely on a friend or carer to read it to them. This allows people to maintain a sense of independence and dignity, rather than become institutionalised, especially where the information concerned is of a private nature. Given that what people with learning disabilities want is so similar to what the wider population aspire to, one could be forgiven for assuming that these desires are readily accommodated in learning-disability care and are empathised with by society. However, Joe explained that in reality people with learning disabilities are effectively ‘retired at the age of eighteen years’; rarely in employment and often even excluded from volunteering. The mentality behind such sidelining appears to be that anyone with a learning disability is a ‘service user’ and therefore in need of assistance. Whilst many people with learning disabilities are indeed users of services, this does not mean that they are not capable and eager to give assistance in their communities and contribute meaningfully not only to their own lives, but also to the lives of others. This restriction in participation is not only a massive loss in terms of potential volunteering and employment opportunities but also completely contrary to the principles of the All Wales Strategy 1983. The strategy stipulates that people with learning disabilities have the right to choose their own patterns of life within their communities and to access to professional services where additional help is necessary for them to achieve this. People with learning disabilities largely DO want to work and to volunteer, said Joe, and we need to make more of an effort to accommodate their needs in theses capacities. Prejudice stems from ignorance and when people with learning disabilities are visible in useful roles, this will make it harder to stereotype them as a burden and give credibility to their voices. Joe’s closing remark, before inviting questions from the floor, was that participation for people with learning disabilities must be realistic and never tokenistic. We must make it possible for people with learning disabilities to enter the workforce with reasonable adjustments made if necessary only when they are capable of fulfilling that role. If you would like to hear more from Joe Powell, you can keep up with Joe’s Soapbox. The ‘Storify’ for the day, including Joe’s presentation, other resources from the event as well as delegate’s contributions via social media is available here. This entry was posted in Citizen's voice, Networks and tagged accessibility, advocacy, communication, discrimination, engagement, information, learning disabilities, networking, networks, participation on July 15, 2015 by Participation Cymru. We held regional participation network events this month in Rhyl, Newport and Carmarthen. 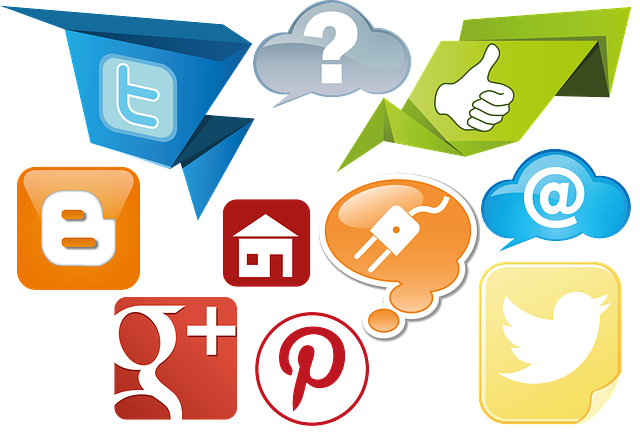 At the network events we explored several free online tools that can be used for engagement. A wide variety of organisations attended and shared a lot of interesting ideas. We will be holding regional network events again in May where local Community Voice projects across Wales will be sharing their work. If you would like to be involved please contact us for more information. This entry was posted in e-participation, Networks and tagged e-participation, information sharing, networks, technology on February 23, 2015 by Participation Cymru. If you’re new to this blog, our regional participation networks are suitable for anyone working in the field of participation and citizen engagement and we run them three times a year in North Wales, South East Wales and South West Wales. Attendees come from a range of different organisations in the public and third sector that focus on a variety of issues. The events are suitable for anyone from any level within an organisation that has an interest in practical participatory work, including consultation officers, trustees, volunteers, development workers and managers. These regional participation networks are suitable for anyone working in the field of participation and citizen engagement. The theme of the events that took place in Glyncoch, Llanelli and Rhyl in October was participative tools and techniques. The sessions offered an opportunity for participants to learn and practice a number of practical techniques that can be used in face to face engagement activity. 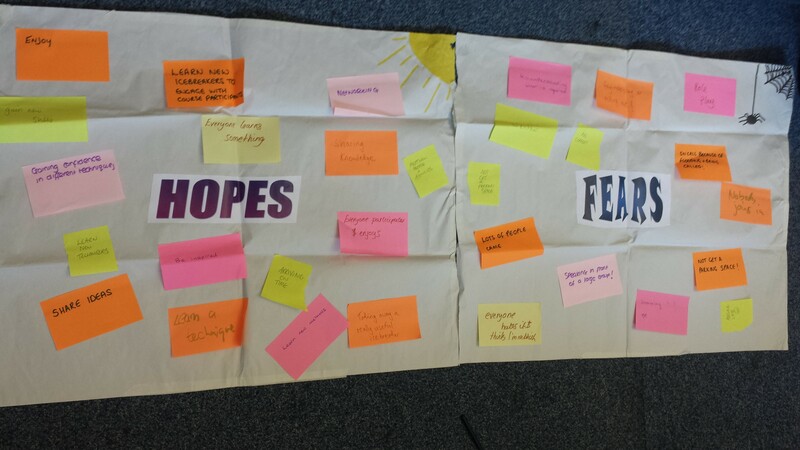 Aims: To identify participants’ hopes and fears. Method: Ask participants to write down their hopes and fears. We used this as an extended ice-breaker to identify what people were hoping to get from the session and what they were afraid of. It’s also valuable to re-visit these at the end of the session, to check whether the hopes were met and the fears were addressed. This technique is particularly useful to use at the start of a session because it allows the facilitator to manage expectations from the beginning; for example if anyone has ‘hoped’ for something which is not relevant or off-topic then this can be made clear. It may also be comforting for participants to see that others share the same ‘fears’ as them – the facilitator could also reassure anyone with legitimate fears relating to the session. Aims: To draw attention to issues by looking at them in a dream/nightmare scenario. This can be both a visioning tool and a problem solving tool. Method: Choose a topic that you want to explore and ask the group to imagine the absolute best and worst version they can imagine. This technique is interesting because it allows the group to explore a situation by looking at it in its most extreme. It is also a very light hearted way of looking at serious issues. Following on from this – you could then move on to thinking about the process of how you achieve the ‘world’s best’ and how to avoid becoming the ‘world’s worst’! 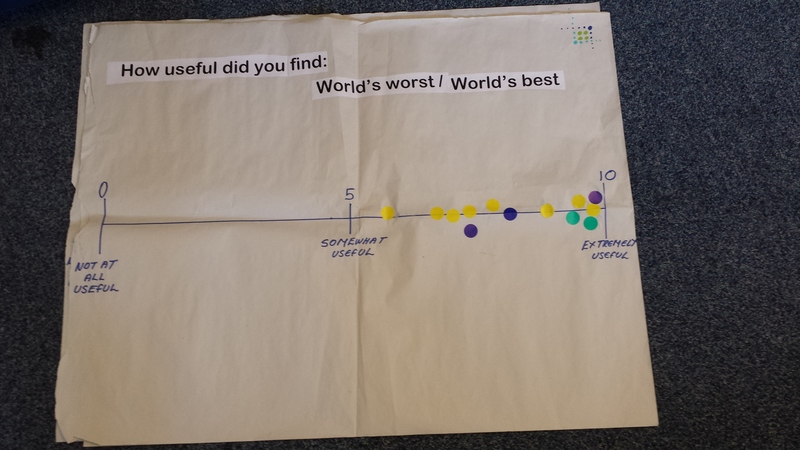 For our network events, we chose the topic of neighbours: What does the world’s best/worst neighbour look like and what characteristics do they have? Aims: To distinguish facts from assumptions and build awareness that what people identify as fact is often rumour or opinion. 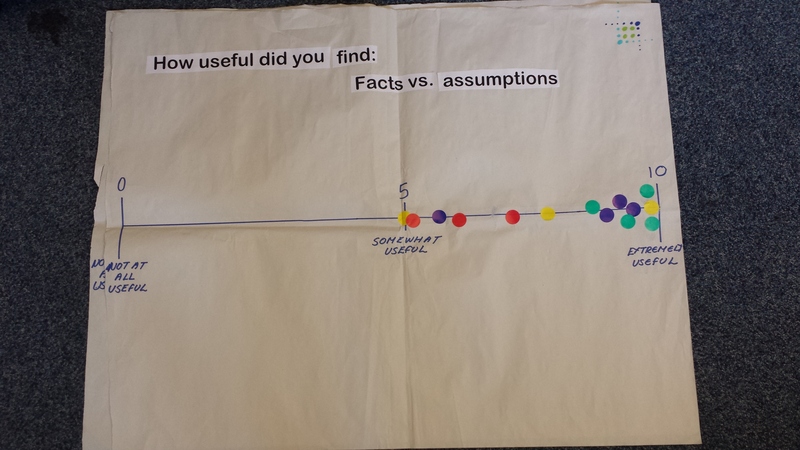 While we were preparing for this technique we were mindful of how to distinguish facts from assumptions and we found it difficult to pick a topic to use for demonstration purposes. We decided to ask what participant’s assumptions were about Participation Cymru and then we were able to ‘myth-bust’ them, which was a lot of fun! Some participants assumed that we were a large team, when we are a team of just four. We then asked attendees to volunteer to be the ‘fact keeper’ for their own organisations and we repeated the exercise with organisations from people in the room. This was a fascinating way of networking and learning about each other’s organisations and it prompted a lot of discussion at our network events. If the topic you’re discussing is controversial then it should be used carefully as facts are not always straightforward – lots of people will see their opinions as facts. This tool could also be used in partnership working between organisations; we use it in our Effective Partnership Working accredited training course. 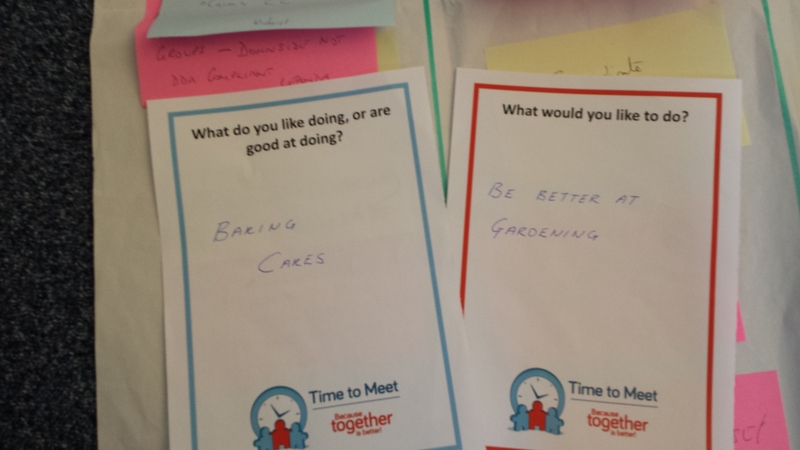 Attendees at the 3 events also shared their own favourite techniques, we always welcome contributions to our participation networks – if you ever have an idea/topic or would like to be involved in planning or delivery our networks then please get in touch. The next round of network events are in February 2015 and they are free to attend. More information will be available soon but you can book early to guarantee your place! Thank you for your continued support of these participation networks. This entry was posted in Networks and tagged citizen engagement, information sharing, networking, networks, participation, partnership, techniques on October 29, 2014 by Participation Cymru. Co-production seems to be the latest buzz word to be found in all sectors of public service and some would argue that is means different things to different people. 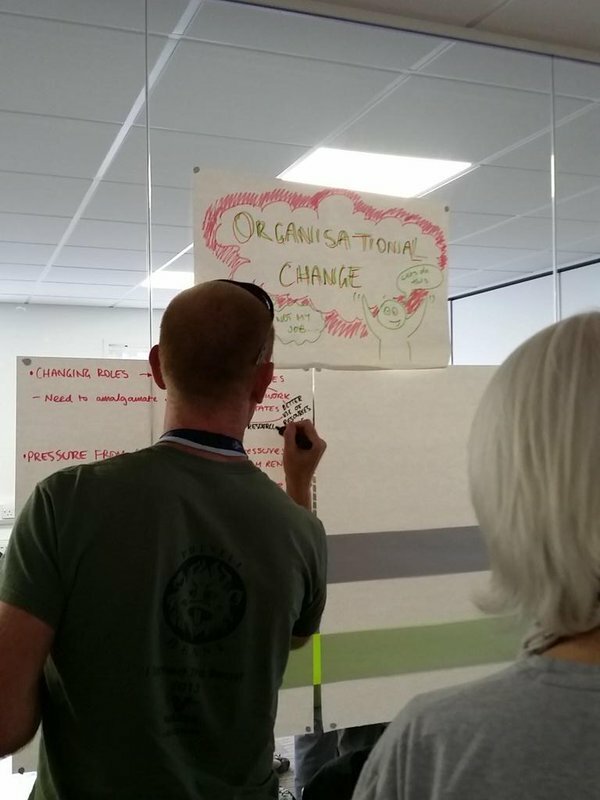 In the participation networks that took place at the beginning of May, we explored what co-production means to people and tried to make sense of what it means in the context of participation and engagement. 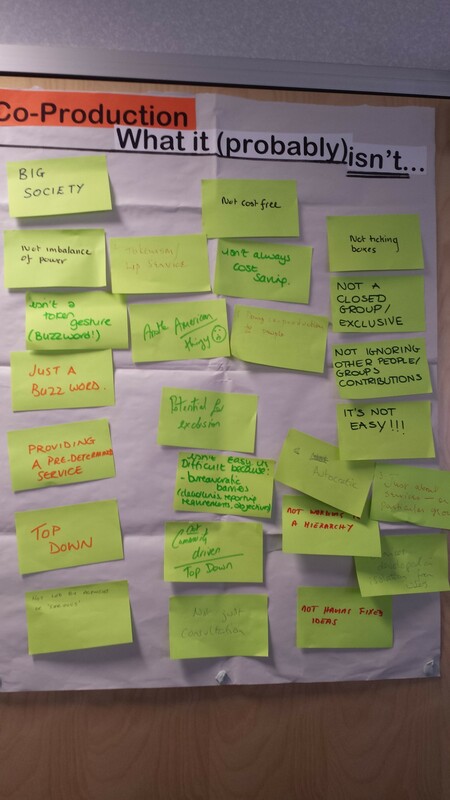 Participants at the network also shared a lot of examples of co-production happening in their projects/organisations – but not everyone is calling it ‘co-production’. As we’ve learned in previous network events (February 2014, October 2013) it’s important not to get bogged down with definitions. We began each network meeting with an ice-breaker exercise. 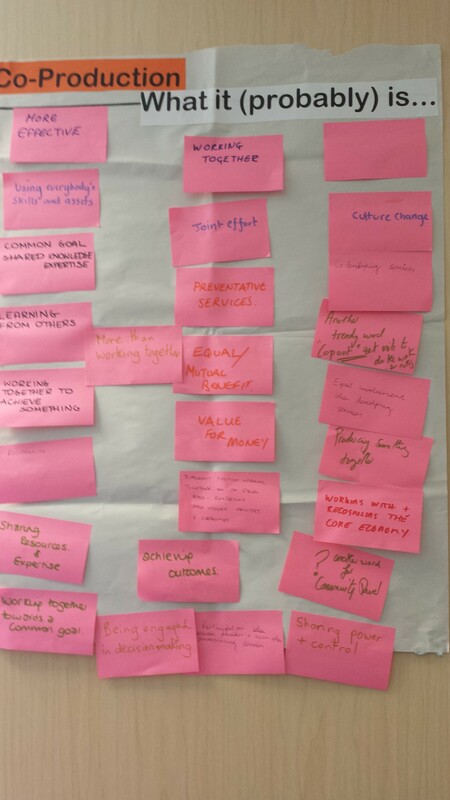 We asked participants to form pairs and think about what co-production might look like, what is probably is and what it probably isn’t. This exercise wasn’t aiming to pin a definition down into words but aimed to identify what working co-productively actually entails. Click here to download the full icebreaker notes. We had a different guest speaker in each event. Anne Collis from Barod was our speaker in North Wales. Barod have produced a sister document to WCVA’s Putting People at the Centre publication called Being at the Centre which will be published shortly. Being at the Centre is written in Everyday English and is aimed at members of the public who use public services. Barod has developed a method that they call coffee shop conversations and they used this technique when developing the Being at the Centre publication. The method involves listening to people’s views in a relaxed environment (coffee shop or cafe) as opposed to a formal consultation meeting. Co-production asks people in organisations to give up their power and to give power to communities and members of the public. Co-production can’t happen unless kick-started by the people at the top, who are often unwilling to share power. Financial pressures. Also a current lack of honesty in communications with the public – many organisations are actually afraid to meet residents and to be honest with them. In South West Wales, the speakers were Rick Wilson from Community Lives Consortium and some project leaders from the Time to Meet project. Time to meet is organised by people with learning disabilities and their friends, family and staff in Swansea. It is there to help members to build stronger social lives with people around them by sharing skills, interests and time. This includes jewellery making workshops, card making workshops, coffee mornings and lots of other activities including their own version of Come Dine with Me called Come Eat With Us! Rick demonstrated a method they use to identify what their members want to do. We were each given red pieces of paper and blue pieces of paper. The red piece had a question: What would you like to do? And on the blue piece: What do you like doing, or are good at doing? Once we’d all written our answers down we put all the papers on the floor and grouped them together. It turned out that a lot of us wanted to learn about gardening and cooking and there were also people in the room who already had knowledge about these topics so as a group we’d immediately identified an opportunity for people to learn and a resource to do so. To end each network meeting we always break into small groups to share recent pieces of work and examples of good practice or just to continue general discussion. Finally participants are asked to complete a participative evaluation exercise. Participation Cymru no longer receive any funding to facilitate and organise these participation networks so we’re very grateful to the participants’ organisations for providing the venues and refreshments (on this occasion: Careers Wales – Bangor, South Wales Fire & Rescue HQ – Llantrisant and Carmarthenshire County Council). We’re also very grateful to the speakers for giving us their time. We will endeavour to keep these network meetings going and the next round of meetings in October will focus on participative tools and techniques so if you would like to demonstrate or try out a technique or if you’re able to contribute anything else to these networks then please get in touch. Next week, Non Humphries will blog about Co-Production in Action. This entry was posted in Networks and tagged citizen engagement, CoProduction, engagement, information sharing, networking, networks, participation on May 28, 2014 by Participation Cymru.